This curriculum series supports student engagement in ecology-based citizen science and science practices: asking questions and defining problems, planning and carrying out investigations, and communicating findings. The citizen science projects provide a natural springboard to these practices and also connect students to real-world research. This implementation guide is designed to provide context and activities related to collecting observations on deciduous trees in temperate forestes using Nature's Notebook protocols. It includes four content areas: Building science skills; Contributing to citizen science; and Conducting independent investigations. There are options for a condensed version and extended version, covering the span of an academic year. It is also linked on the USA-NPN NCO YouTube Channel, Videos created by our Partners PlayList. The guide was produces by a team of authors at University of Minnesota Extension. Thompson, Ami; Strauss, Andrea L.; Oberhauser, Karen S.; Kooman, Michele H.; Montgomery, Rebecca; Andicoechea, Jonathan; Blair, Robert B.. (2018). 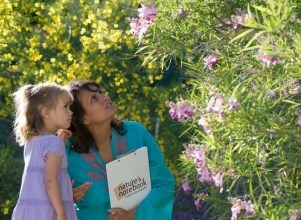 Driven to Discover Citizen Science Curriculum Guide: Phenology and Nature's Notebook. University of Minnesota Extension. Retrieved from the University of Minnesota Digital Conservancy, http://hdl.handle.net/11299/198624. Local Phenology Leaders using Nature's Notebook for engaging students, volunteers, and community partners are able to use resources available from the USA-NPN to create annual reports for their stakeholders. The Visualization Tool and Phenology Program Dashboards are useful resources available for summarizing phenology observational records, numbers of observers, numbers of observations made, and more. Read an example report from a Local Phenology Program at the Valle de Oro National Wildlife Refuge and an example from the Gulf Coast Phenology Trail (an aggregation of multiple Local Phenology Programs) for ideas on what you might include in your annual report. Don't forget the National Coordinating Office conducts an annual Active Group evaluation as well - share your annual reports and impact statement with us! This lesson helps students become familiar with plant and animal species present in an oak tree ecosystem. They are also asked to explore the USA-NPN's Visualization Tool and, from the data, draw conclusions about how climate and climate change affect plant phenology. This lesson was submitted by Peter Malecki for partial fulfulment of the requirements for the Local Phenology Leader Certification Program in the Spring of 2018. This phenology class was presented in a 3-hour training course for Master Naturalists. Define phenology and explain how it is an indicator of climate change. Describe phenology from a historical perspective, culturally and ecologically. Krutch, J.W. (1985). The Desert Year. Tucson: University of Arizona Press. The class included examples of phenological mismatch for the Sonoran Desert. This information can be swapped out for other geographic regions. It also included several hands-on activities in the field, exploring the Nature's Notebook protocols. Worksheets for the activities are included above. Homework assignments are also included. Offered in addition to this lecture was a 3-hour field lab session designed to take a further look into the protocols and learn how to collect observations on species of interest at a nearby partner group site. You can browse other Master Naturalist presentations in our workshop archive or here and here. This lesson can be used as a supplement in a course designed to demonstrate climate change impacts on biotic species or a course designed to study the natural history of species in a given range. Prior to presenting this lesson the instructor should familiarize themselves with the USA-NPN’s Visualization Tool (usanpn.org/data/visualizations) and First Leaf and First Bloom maps (Spring Index Maps; usanpn.org/data/maps). Both tools have accompanying technical documentation on the website, including tutorial videos and info sheets. The instructor should also identify a study range and at least two species of interest for student to explore, found on the Nature’s Notebook Plant and Animal list (usanpn.org/nn/species_search). In this example the Tucson Basin was chosen for exploration of the Spring Anomaly and the Northern red oak and Blue Jay were chosen to demonstrate the species phenophase overlap in the Activity Curve. The Activity Curves are designed to display phenological information such as resource availability in an ecosystem. Included with this assignment is an editable student page where the instructor may edit the range and species to be explored. Conduct this activity before students are introduced to data collection using the Nature’s Notebook observation protocols. This activity will familiarize students with some of the main phenophases present on select species during certain times throughout the school year. After students do this activity you may wish to have them make observations using the Nature’s Notebook observation protocols and then at the end of the year students can view their collected data in conjunction with the data they viewed during this activity. This activity was submitted by Sol Henson from the Sierra Streams Institute for partial fulfulment of the requirements for the Local Phenology Leader Certification Program in the Spring of 2018.